The load test in Visual Studio are a great help to stress/performance test you applications. With the web test you “should” be able to record actions as you use your application. 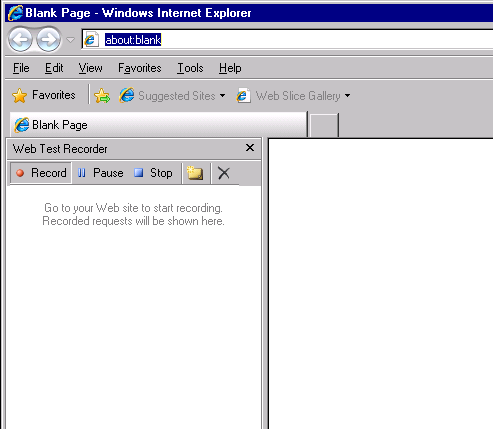 When you add a web test IE starts and there should be recorder bar on the left. When ever I created a web test I never saw the web test recorder bar show up. I didn’t even know I was missing it. So, I was never able to get to do anything besides record that you launched a page which helps you test page load time, but doesn’t help you when your trying to determine the response time when clicking a button on your page. After a little research (little as in there are few articles explaining this problem), I found a blog post explaining why the web test recorder not working. It turns out to be a 64-bit issue. There are some registry keys that need to be deleted, so IE will rebuild what explorer bars are available. This entry was posted in Visual Studio Testing and tagged .NET, .NET Framework, Component Frameworks, Microsoft, Microsoft Visual Studio, Performance Testing, Programming, Test, Tools, Unit testing, Visual Studio, Visual Studio 2008. Bookmark the permalink. I tried this solution,but these registeries are recreated after reboot.This doesn’t fix the problem.Any other solution. Are you on a 64bit OS? Are you using IE 8? Have you tried disabling all add-ons? Hi, This solution work properly for me. But don’t reboot your computer,close all of IE and open again after finish following this solution. * I don’t know why reboot are recreate these registeries key anybody can tell me? You are the MAN! I was scouring all over and running reflector even trying to diagnose how the InternetExplorer object was getting passed into the CTOR of the Microsoft.VisualStudio.QualityTOols.WebRecorder….finally someone with the answer!